ALL-NEW MARVEL NOW! Look-Ahead Finale! Home » ALL-NEW MARVEL NOW! Look-Ahead Finale! Part 5! Here are the ongoing titles rebranded All-New Marvel Now! that will launch with .NOW numbering designations devised to drive the more OCD fans bugnuts! Part 2, covering Black Widow to Iron Patriot, can be found here. Part 3, covering Loki to The Punisher, can be found here. Part 4, covering Secret Avengers to X-Force, can be found here. The Marvel Now! Report Cards can be found here, here and here. All New X-Men #22.NOW. Writer: Brian Michael Bendis. Artist: Stuart Immonen. Bendis and Immomen breathed new life into the X-Men franchise with their time-lost original teen heroes coming to the present. With time traveling the motif du jour thanks to the upcoming “X-Men: Days of Future Past” film, this book should hit all the right notes as Bendis continues his run through 2014. Prognosis: It’s been a perfect ride so far, and with the Trial of Jean Grey coming, things should get very Phoenixy very soon. Begins in January. Avengers #24.Now. Writer: Jonathan Hickman. Artist: Esad Ribic. 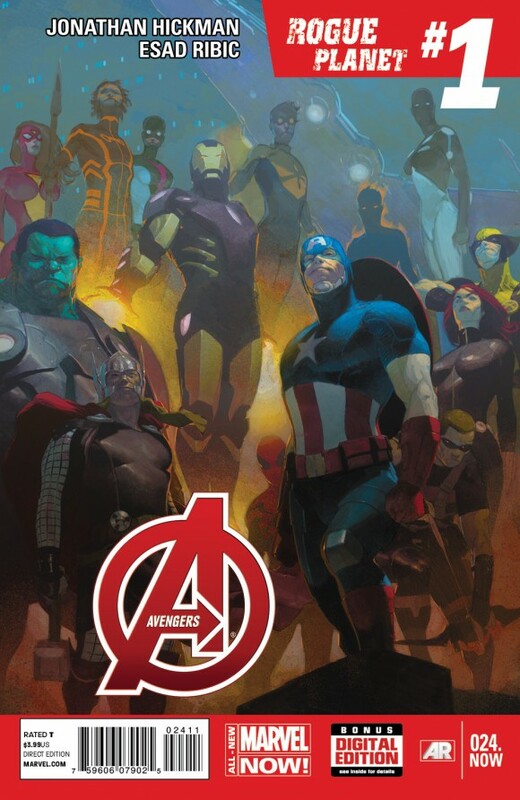 Now that Infinity’s over, Hickman can confine his complex narrative to his Avengers title. It will be fun to see how the new team operates now that they have finished with the huge galactic threat that was Thanos and Infinity. History shows that the longer Hickman goes on a book, the tighter the plotting becomes so fans should be in for a treat this year. Prognosis: The hottest property in comics is in good hands as Ribic is one of the most exciting visionaries in comics today. Combine this with Hickman’s huge ideas, and the Avengers’ momentum should continue till the new film debuts. Does Hickman have Ultron plans as we get closer? Begins this month. Avengers A.I. #8.Now. Writer: Sam Humphries. Artist: Andre Lima Araujo. A book that should seem important as we head towards the Age of Ultron, but seems derivative and forced. With the mutants and the Inhumans playing the marginalized superhuman card, the robots-as-besieged-minority idea seems like an afterthought. Prognosis: Not good. Marvel’s dragging out the Uncanny Avengers for a sales boost, but it would take Skynet to save this book. Begins in January. Captain America #16.Now. Writer: Rick Remender: Artist: Pascal Alixe and Nic Klein. Remender sure knows how to tug at the old heart strings, huh? After an extended (some would say too extended) stay in Dimension Z and suffering unimaginable loss, Cap must again be the man out of time and navigate his way through the contemporary Marvel Universe. The focus would seem to be on Cap acclimating himself to not struggling for survival in the Zola Dimension and on the arrival of Jet Black, Zola’s daughter, to the MU. The story has been riveting stuff so far, so look for that to continue. Prognosis: The only issue this book might have is that it will be too far from the grounded narrative of the upcoming “Captain America: The Winter Soldier” film. There is a worry that loading the book with too many outlandish sci-fi concepts might confuse new readers looking for the type of stuff they thrilled to on screen. I guess that’s what Brubaker Omnibi are for. Begins in February. Guardians of the Galaxy #11.NOW. Writer: Brian Michael Bendis. Artist: Sarah Pichelli. The spotlight on these characters is about to get very bright. One would assume we are close to a trailer, and as we get closer to August, the buzz around these characters should be deafening. Bendis seems to be up to the challenge with the acclimation of Angela to the Marvel Universe, a crossover with the Uncanny X-Men, and the arrivals of Captain Marvel and Agent Venom to the team. Things seem to be moving at a frenetic pace in Marvel’s most innovative title. Prognosis: With Sara Pichelli on board, things have never been hotter for these cosmic champions. Once the world gets their first gander at the film’s Rocket Raccoon, the sky’s the limit for this title.Begins in January. Nova #13.NOW. Writer: Gerry Duggan. Artist: Paco Medina. Nova has been a blast for fans open minded enough to embrace Sam Alexander as Nova. New writer Gerry Duggan will be adding Beta Ray Bill to the fold, making him a regular supporting character, which is awesome. Duggan has proven himself over in Deadpool and this title is in good hands for those willing to try it. 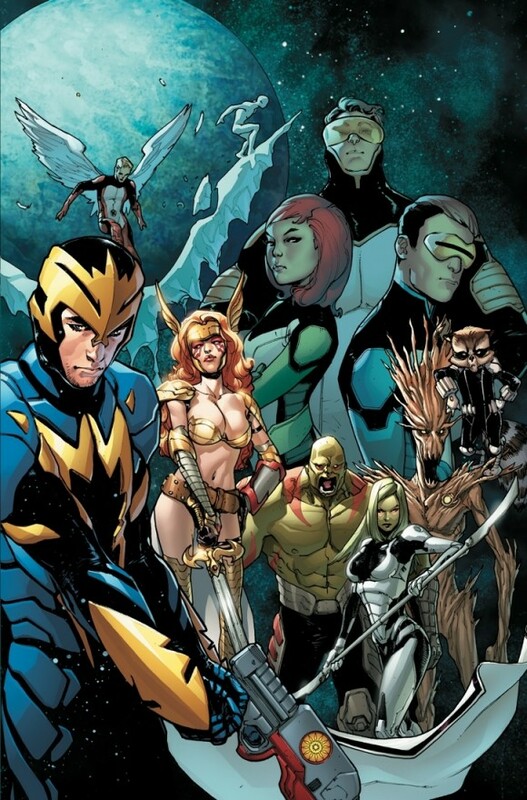 Prognosis: The Nova Corps will be appearing in Guardians of the Galaxy, which can almost assure that Nova will be soaring on the big screen someday soon. This can be the start of the Nova Generation, or it can fall to reader prejudice as they stand firm and demand the return of Richard Rider. And probably not read the book anyway. Begins in February. 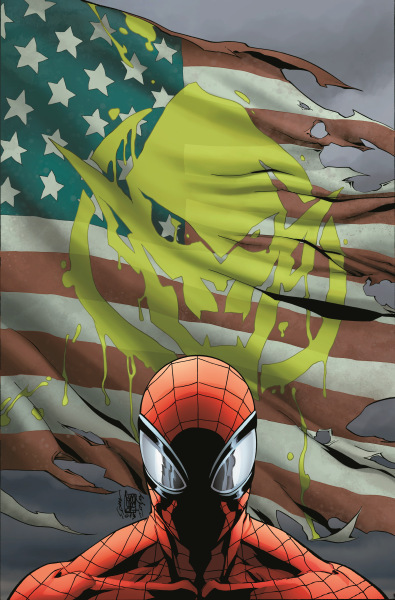 Superior Spider-Man #20.NOW. Writer: Dan Slott. Artist: Giuseppe Camuncoli. Things will heat up with the All-New launch of the book, as the Green Goblin arrives to make OctoPeter’s life a living hell. So far, as Spider-Man, Otto has faced second stringers and villains he was clearly … Superior to, but now, Spider-Man’s greatest enemy has returned. But who is this Goblin? I think I know, but I don’t want to risk spoiling. Slott, who has a knack for doing the unexpected, is gearing up for the biggest showdown of his career. Prognosis: With Peter dead in the Ultimate Universe and Dr. Octopus inhabiting Peter’s body in Superior, does Marvel dare go into a movie year with no Peter Parker anywhere? It looks like it, as Marvel proves they have brass balls. But will it backfire? Not with Slott’s ability to innovate and surprise. Begins in February. Thunderbolts #20.NOW. Writer: Charles Soule. Artist: Carlo Barberi. Charles Soule breathed new life into the Thunderbolts after a dud of a premiere, and his run continues with the arrival of Johnny Blaze to the team. This has become a fun book under Soule, and one hopes that readers who abandoned ship with the first arc will return. Prognosis: There is not a great deal of buzz around this book, but many of the current Thunderbolts are being featured in new solo books which may give this title some needed exposure. Begins in February. Winter Soldier: The Bitter March. Writer: Rick Remender. Artist: Roland Boschi. There darn well better be a Winter Soldier book come film time. It’s cool that the writer on Cap will be guiding Bucky’s adventures and hopefully the events of this mini-series will dovetail into Cap, creating a market synergy between comic and film. Prognosis: Remender should be able to flex some different writing muscles than he is on Cap or Uncanny Avengers as he can do a tight little espionage story in lieu of his usually sweeping epics. Fans are going to be looking for Bucky stories come April, and this book looks like it is ready to deliver. Begins in February. Wolverine and the X-Men. With Jason Aaron departing the book, the book’s focus with turn to the younger mutant heroes introduced in the previous run. Jason Latour is a capable writer, but the New Mutants, New X-Men, new whatever characters of the X-Universe, have always been a hard sell. Pixie, Broo, and the rest are popular, but are they popular enough to survive? Prognosis: If any of these kids appear in the new X-Men film, look for interest to build, but without Aaron, this book could easily go the way of all the young mutant books before it. Begins in March.